Consider a projectile being launched at an initial velocity v0 in a direction making an angle θ with the horizontal. We assume that air resistance is negligible and the only force acting on the object is the force of gravity with acceleration g = 9.8 m/s2. Also an interactive html 5 applet may be used to better understand the projectile equations. Projectile problems with solutions are also included in this site. 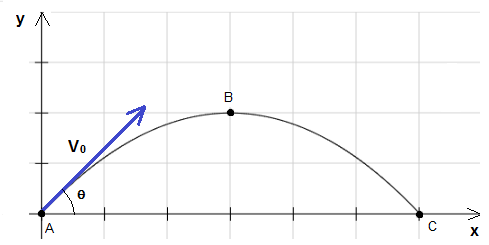 The time of flight is the time taken for the projectile to go from point A to point C (see figure above).